Either Prof. Sansen’s inversion coefficient (IC) approach or Prof. Murmann’s Gm/Id design methodology is telling the same story of power-aware analog design. 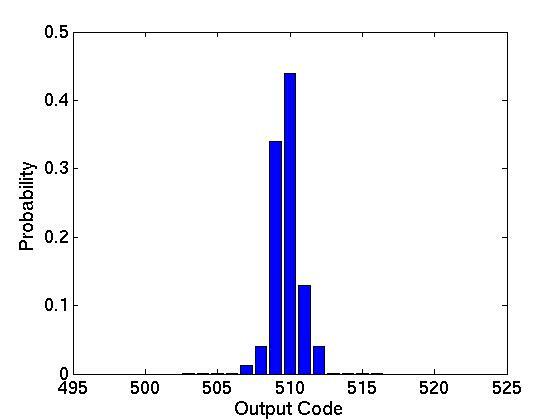 With the help of Gm/Id design kit, I can easily visualize the transistor performance as a function of its gate-source voltage (see Fig.1). As VGS increases, the transistor undergoes the weak, the moderate, and the strong inversion. For high gain, we go left; for high speed, we go right. Being far-left, the gain is not increasing but the speed drops extremely low; being far-right, the speed is not increasing but the drain current is still climbing! For a decent figure-0f-merit (speed*gain), go to the middle, go moderate! where n is subthreshold slope factor and UT is thermal voltage. At room temperature, 2nUT is about 70mV . As Fig.2 shows, the IC-V curve matches well with the weak for IC < 0.1 or the strong for IC > 10; the moderate locates where IC is between 0.1 and 10. W. Sansen, “Minimum power in analog amplifying blocks – presenting a design procedure ”, IEEE Solid-State Circuits Magazine, fall 2015. Negative feedback is ubiquitous, and the discussion on its stability can be found everywhere. For ease of reference, I will put a memo on the equations to calculate the phase margin. It can be seen that the phase margin is determined by the relative position between the equivalent non-dominant pole and the unity loop gain bandwidth. Earlier in 2012, I wrote an introductory post about EKV model and later extended the related topic a little bit in another post – Stay Simple – Square-Law Equation Related. Since then I keep following the information about the EKV model and the inversion-coefficient-based analog design methodology. One of the major contributors on this design methodology is Prof. Willy Sansen. He has given a short tutorial named Impact of Scaling on Analog Design. The tutorial was organized by ISSCC through edX (free access after registration). Most recently he also published an article  to summarize his idea in the IEEE Solid-State Circuits Magazine. The journey starts with a beautiful equation which nicely links the weak and the strong inversion (see the curve in Fig.1). Fascinated by Prof.Sansen’s design procedure, I tried to apply it to my daily design work. Theoretically, it does give me a broader view and some insight on the low-power design. However, practically I find it difficult to make full use of it. Especially nowadays most of the design enters into the deep submicron region, and the model parameters are so complicated to interpret. Then there comes another big guy – Prof. Boris Murmann. Yes, the professor provides the famous ADC performance survey! Now the professor also launches his gm/Id starter kit. The kit provides scripts that can co-simulate between SPICE simulator and Matlab and store transistor DC parameters into Matlab files. The data stored can then be used for systematic circuit design in Matlab. It looks brute-force but yet smart and efficient! The topic of noise-shaping SAR ADC will come to an end in this post. In Part A, I briefly talked about the concept of noise shaping applied to sigma-delta modulators. 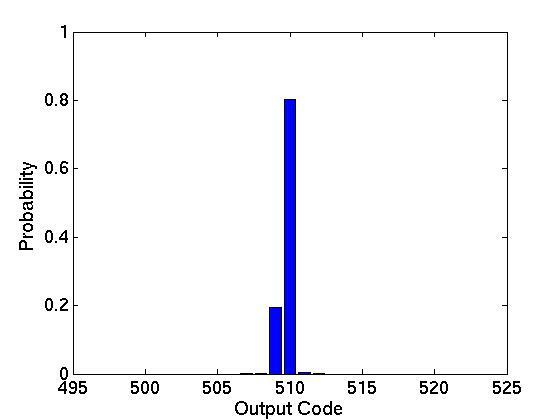 In Part B, I introduced one special property of SAR ADCs which can be utilized to perform noise-shaping – the SAR architecture can generate the conversion residue without a feedback DAC. Then some form of noise shaping was achieved, but the result was not so satisfactory. In this post, I will continue the journey. I would like to stop here (because weekend is coming ;-). If you want to know more about practical solutions. I recommend the interesting and well-written paper . I would like to thank the authors. I enjoyed a lot reading their paper. J. A. Fredenburg and M. P. Flynn, “A 90-MS/s 11-MHz-Bandwidth 62-dB SNDR Noise-shaping SAR ADC”, JSSC, vol.47, 2012. In the previous post, I’ve shared some basics of sigma-delta ADC. In this post, before we look at the noise-shaping SAR ADC, let’s again do a warm-up. The linear model has the same transfer functions as the one in Fig.6 of the previous post, where a delaying integrator is used as the loop filter. Keep this in mind. Now let’s try to make the SAR do the noise shaping. According to Fig.1, the simplified equation can be rewritten as . Then we need to sample this residue and store it somewhere else. How about this method? Now it comes to the discussion about choosing the value of C_R. What will the linear model look like? Noise does be shaped! In addition, it seems using a small residue sampling capacitor is fairly good compared to larger ones (Note that the kT/C noise during residue sampling presents itself to the comparator input and can also be shaped together with the quantization noise and the input-referred comparator noise ). However, compared to the 1st-order modulator, this way of noise shaping is much less efficient. We could do better! How? The next post ;-). Sometimes it is much easier to become a fan of something when you only know something about it. Just like Sigma-Delta ADC, it is so complicated that even though I have learned it for several times I still can’t fully understand it! Nevertheless, I am still a fan of it ;-). Sigma-Delta ADCs dominate in the high-resolution domain (though they are not extremely fast, actually kind of slow…). Fig. 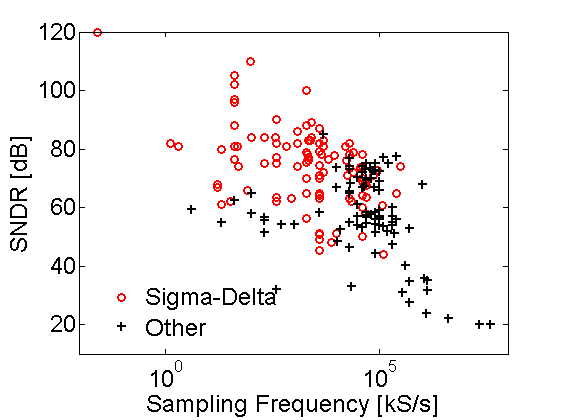 1 Signal-to-noise-and-distortion ratio (SNDR) versus sampling frequency of Sigma-Delta ADCs and other Nyquist ADCs (SAR, Pipeline, and Flash). The data were reported in ISSCC, and collected by Murmann’s ADC survey . I am currently doing successive-approximation-register (SAR) ADC. SAR ADCs are quite energy-efficient, but less accurate than Sigma-Delta ADCs. Fig. 2 Energy (P/fs) versus SNDR of SAR ADCs, Sigma-Delta ADCs, and other Nyquist ADCs (Pipeline and Flash). The data were again extracted from Murmann’s ADC survey . 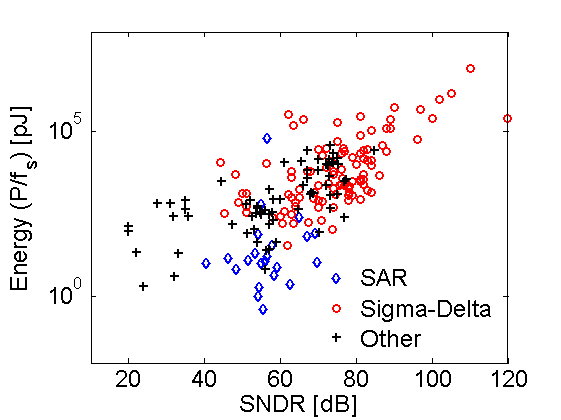 In order to achieve high resolution, can SARs shape the noise just as Sigma-Delta ADCs do? People have tried to imploy noise-shaping technique into the SAR architecture [2, 3], but so far the reported performance (with chip measurement) is not very compelling (SNDR = 62dB , Power = 806uW, Bandwidth = 11MHz, FoM = 35.8fJ/conv) . 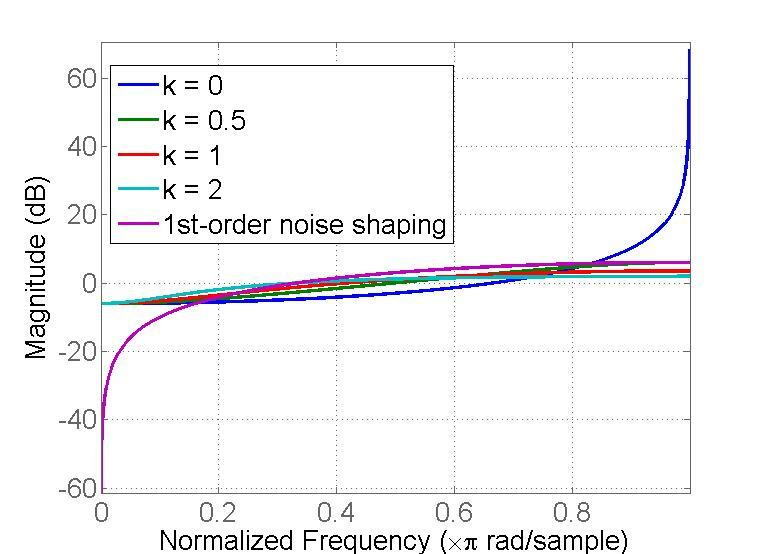 Nevertheless, the idea of noise-shaping SAR is so intriguing. Before entering into this topic, I would like to do some warm-ups – some basics of Sigma-Delta ADCs (yes, that’s all I know about it). 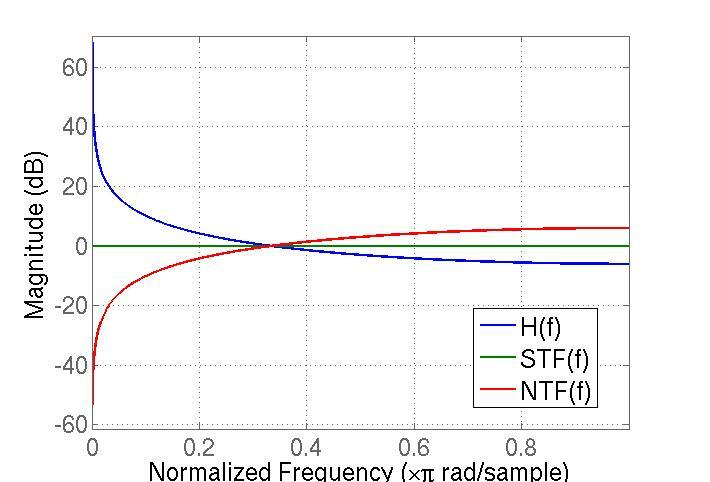 Doubling the sampling frequency gives 3 dB increase of SNR. However, oversampling is seldom used alone, and it is commonly used together with the noise-shaping technique. 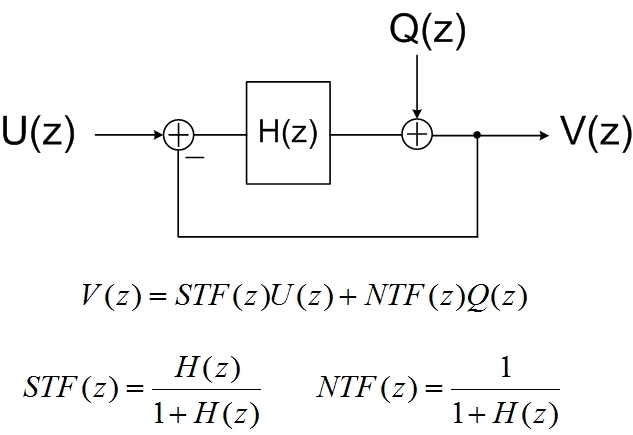 Filtering is introduced into the ADC to further suppress the in-band quantization noise power. At the same time, the filtering does not affect the input signal. By applying a loop filter before the quantizer and introducing the feedback, a sigma delta modulator is built. 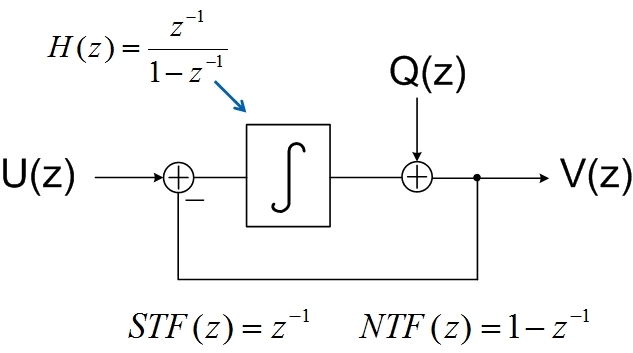 According to STF and NTF, if the transfer function of the loop filter H(z) is designed to have a large gain inside the band of interest and small gain outside the band of interest, the signal can pass the modulator and the noise can be greatly reduced. Bingo! The signal is passed to the output with a delay of a clock cycle, while the quantization noise is passed through a high-pass filter. 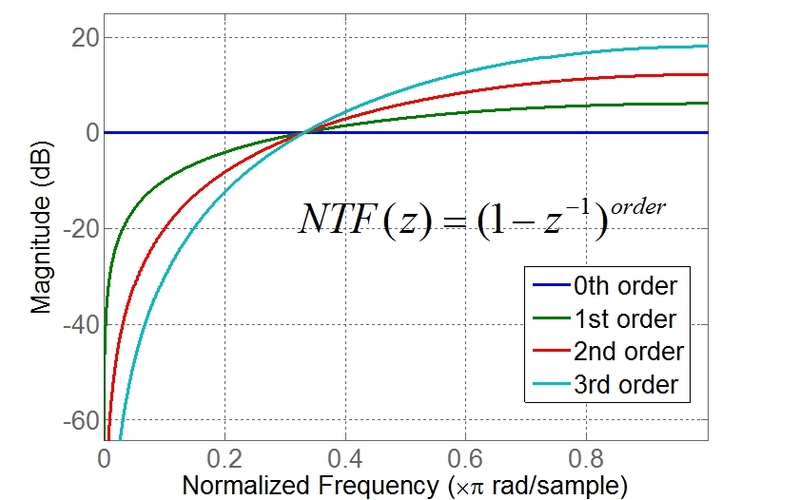 Doubling the sampling frequency gives 9 dB increase of SNR for 1st order noise shaping. This post tells the basic story of noise-shaping. In the next post, I will try to learn how noise-shaping can be used in SAR ADCs. B. Murmann, “ADC Performance Survey 1997-2014,” [Online]. Available: http://www.stanford.edu/~murmann/adcsurvey.html. K. S. Kim, J. Kim, and S. H. Cho, “nth-order multi-bit \Sigma-\Delta ADC using SAR quantiser”, Electronics Letters, vol. 46, 2010. R. Schreier and G. C. Temes, Understanding Delta-Sigma Data Converters, 2005.